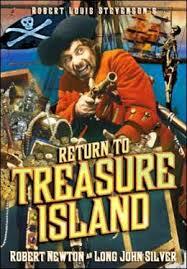 Treasure Island is the most famous pirate story every written, and the most famous pirate in it, beyond a shadow of a doubt, is Long John Silver. 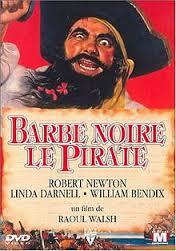 And the most famous Long John Silver was the actor Robert Newton. 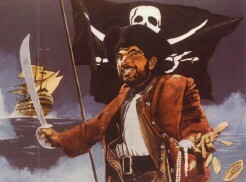 Robert Newton gave us pirates. Henley spoke of his punishments and torment out of experience. One of his legs had been amputated for “tuberculosis of the knee,” and he later spent nearly two years in Edinburgh Royal Infirmary having his remaining leg saved by the great surgeon Joseph Lister, at the expense of immense personal suffering. Robert Newton was born on June 1, 1905, in Shaftsberry, Dorset. 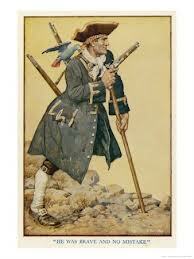 Newton grew up in what is called the West Country of England, a place which was the origin of many real pirates. The son of landscape painter Algernon Newton, he started his career as an actor on the stage at age 16, in the Birmingham Reparatory Theater. He was soon working in London, and did well in a variety of plays, including Horatio in Lawrence Olivier’s 1939 production of Hamlet. During WWII Newton served in the Royal Navy, and, strangely enough, continued acting in films, including a version of Oliver Twist in which he played a truly chilling Bill Sikes. We don’t think of Britain producing movies while they were fighting the Nazis, but folks at home needed to have some entertainment. During the war, Disney studios had released several of their movies in Britain, and had made quite a bit of money. After the war, they were faced with a problem. The British government, nearly in financial ruin after the war, insisted that money made in Britain must be spent in Britain. Disney, in need of cash himself after contributing heavily to the US’s need for non-profit war films, decided to produce his first live-action movie (a necessity since his animation studios were in California) for distribution in both Britain and the US. Disney, who had seen and been fascinated by a live-action production of Peter Pan as a child, decided to film Stevenson’s Treasure Island, probably in no small part because the book was in the public domain, and he would only have to pay to have the screenplay written from an already respected story. The American child actor Billy Driscoll had already worked for Disney in Song of the South, and was a logical choice to pay Jim Hawkins, but the rest of the cast were British. Newton, who had topped lists of favorite film actors among British boys, was the biggest name in the cast, but Disney probably got a bargain. Newton had a history of drinking, and it was getting worse. Driscoll was only able to get a 3-month work visa, so all his scenes were filmed first. Newton, always a flamboyant man, used his own West Country accent as the basis for Silver’s voice, and hammed it up dramatically. Both choices were sound decisions for the part. The accent was an appropriate one for a pirate, and the character of Silver is charming, enthusiastic, powerful and sly. Newton was all of these, and more besides. The movie – Disney’s first all live-action feature, was a solid success, paving the way for Disney to create more live-action films, and Newton had defined Long John Silver as much as Bella Lugosi had defined Dracula. Ever after, talking like a pirate meant talking like Robert Newton. Disney went on to make Peter Pan, the Pirates of the Caribbean ride (where all the voice-actors imitate Newton) and the Pirates of the Caribbean movie series. And Newton made other pirate movies – Blackbeard the Pirate, and an Australian made sequel to Treasure Island, titled either Long John Silver or Long John Silver’s Return to Treasure Island. 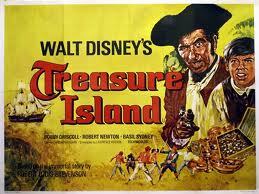 He also starred in a 24 episode 1954 TV series called The Adventures of Long John Silver. It might surprise some people that these later works were not related in any way to the Disney movie, but remember – Treasure Island was already in the public domain. Silver, Flint, Jim Hawkins and the ship Hispaniola could be used by anyone. Newton went on to play the part of Javer in Les Miserables and a few other roles, but his alcoholism was getting steadily worse, and his appearance at work was sporadic. It became difficult for Newton to find work. His talent was wide-ranging, but so many people remembered him only for his pirates. Today, his voice has been the inspiration for everything from Quint in Jaws to Mr. Crab in Spongbob. Newton’s impressive vocal characterization gave us “Talk Like a Pirate Day” (September 19th) and imitations of his distinctive vocal characterization have appeared in everything from Monty Python’s Flying Circus to Lost in Space. 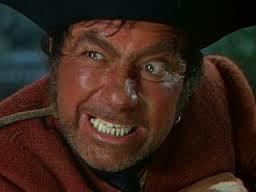 If you’re ever pretended to be a pirate and said, “Arr!” you are imitating Robert Newton. “Mr. Niven has a great talent for the understatement,” came the reply. Newton was hired, on the stipulation that he did not drink at all during the production. To the surprise of most, he kept his word, and his performance was flawless. But after his part of the filming was over, he confessed that he had been motivated by more than his promise to the director. That very morning Newton’s doctor had told him that one more decent into the bottle would kill him. He was dead less than a week later, in the arms of his wife, Vera. The official cause of death was a heart attack. That's incredible that he is the father so-t-speak of what we identify as a pirate in many ways. Sad that he died at that age, alcoholism is awful, I've known many people to lose their lives literally and/or financially due to drinking problems. As a side note I just want to point out how alcohol is nationally legal as well as many dangerous drugs otc and prescribed by doctors, even caffeine. I hope soon we can have cannabis nationally legal if people can realise it's actually way less harmful and even benefits people Vs these other drugs.